Stocks closed higher in a quiet, holiday-week session. Most big money managers are on vacation, so don’t expect a lot of meaningful trade this week. But the low volume leaves us vulnerable to volatility as smaller traders exert more influence over the market. Paradoxically, the higher the market goes, the more nervous traders get. In AAII’s latest bulls/bears survey, bullishness actually decreased 9%, hitting 5-week lows all while the index kept setting record high after record high. 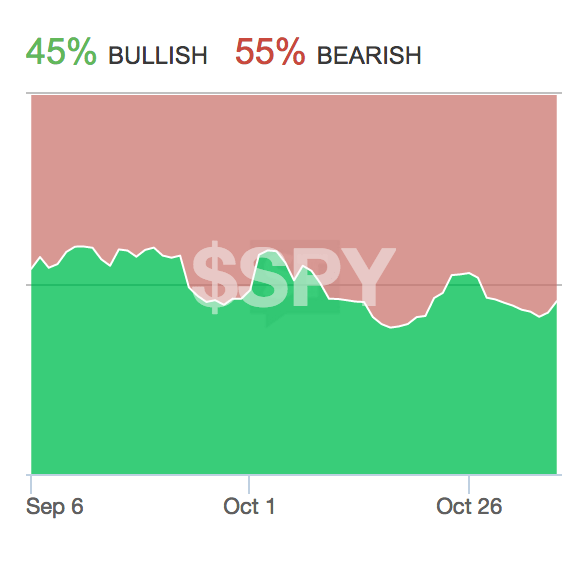 We see a similar phenomena in the Stocktwits’ SPY sentiment gauge that is still more bearish than bullish. Don’t let anyone fool you into believing this market is overly bullish simply because we are at all-time highs. Almost every day in September and October ended with above average volume. That tells us there was a whole lot of selling going on. All of it at lower levels from these record highs; some of it at much lower levels. These recent sellers are falling victim of regret while they watch the market march higher without them. Pressure is mounting to jump back in as the fear of a market collapse is quickly giving way to fear of being left behind. 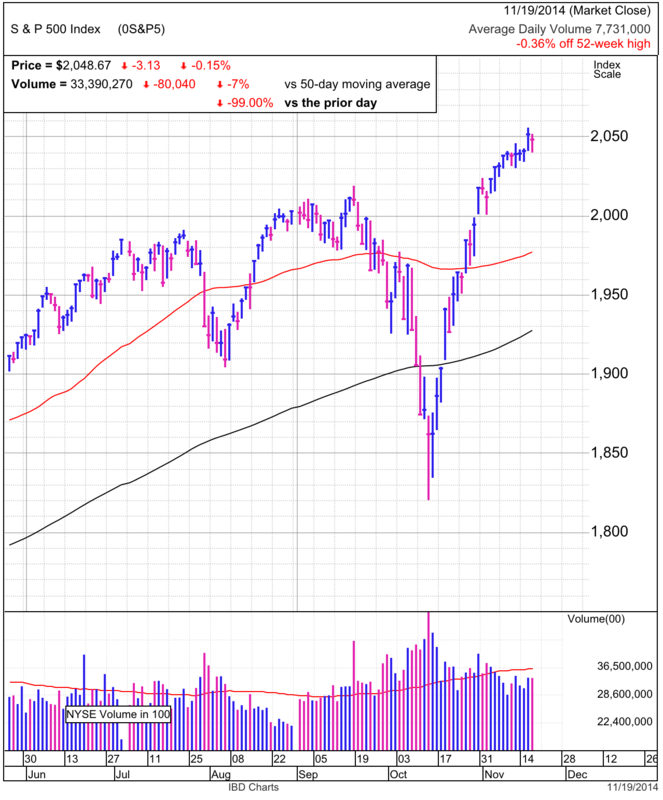 Expect the market to continue higher as these regretful sellers continue chasing the market higher into year-end. 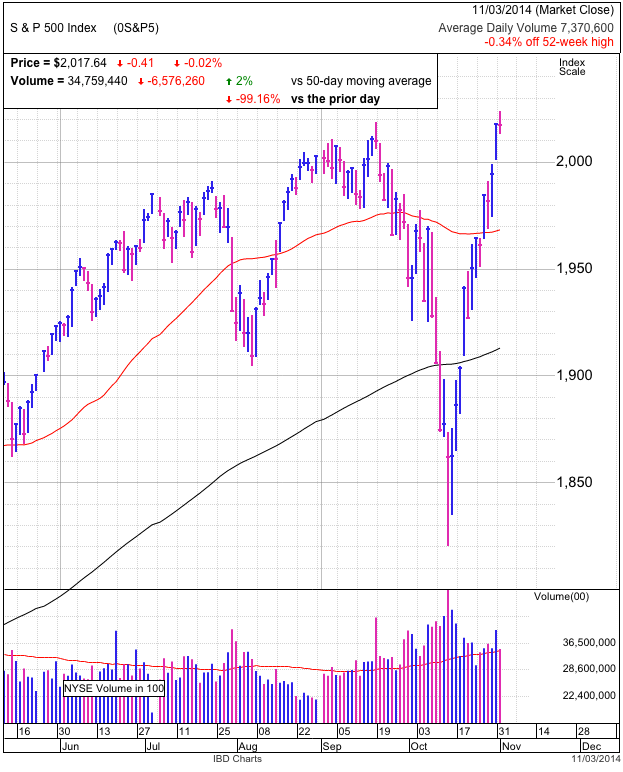 Volatility crept back into the market as early trade gave back all of Tuesday’s gains. It was a gut-check for bulls when prices slid nearly non-stop through the first two hours. But just like it was supposed to, prior resistance at 2,040 turned into support and we bounced right off of 2,040. While we still finished in the red, the midday rebound was clearly bullish. With fresh memories of October’s demoralizing plunge, traders still have a hard time warming up to this relentless assault on record highs. The lack of enthusiasm is clearly evident through the low volume rally. Everyone automatically assumes the market has to be wildly bullish as it sets new high after new high, but burned traders remain far more skeptical than they were earlier in the summer. This doubt and worry is the fuel that keeps pushing the market higher. Big money was patting themselves on the back when they took profits this summer, but countless all-time highs later, these same managers are under intense pressure to buy back in at higher levels, else they risk being left even further behind. It is this pressure to chase that keeps a bid under the rally and why every ten-point dip keeps getting bought. Owners that don’t want to sell and managers that need to buy is a recipe for higher prices. Stocks smashed through 2,040 resistance and closed above 2,050, setting yet another record high. Volume was more brisk than in recent days as these gains triggered a wave of technical breakout buying and short-covering. Too often people mistakenly think contrarian investing means going against the trend. They see something they think has gone too-far, too-fast and are convinced the underlying data doesn’t support the move. They see themselves as a savvy contrarian investor when they bet against the move. But all too often this ends up being a costly mistake. Contrarian trading has nothing to do with the trend or technicals. It is only about the crowd and its mood. It doesn’t matter what the underlying price action is. Sometimes it is contrarian to go against the trend, but more often than not it means betting on the trend no one believes in. October’s plunge left traders with a cynical hangover. Even at record highs, they continue talking down this market and are certain we are on the verge of crashing lower. Many of these traders bailed out during October’s selloff and were left behind by the subsequent rebound. They are desperately hoping for the breakdown so they don’t feel so foolish for selling last month. Unfortunately for these cynics, with so many people bashing the market, the contrarian trade is buying the breakout. 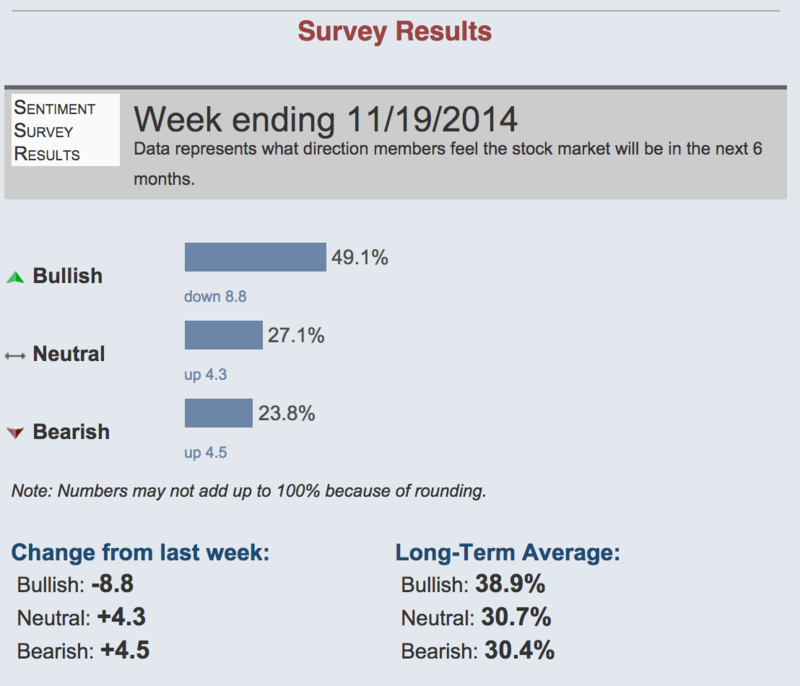 AAII’s Asset Allocation Survey showed equity allocations are at 14-month lows. 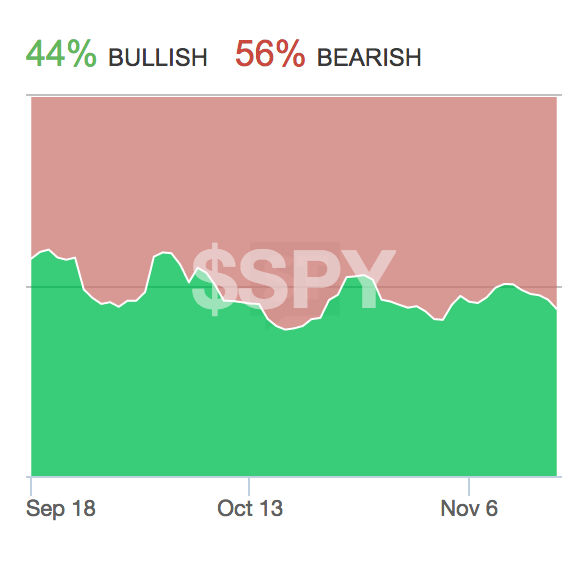 Stocktwit’s SPY sentiment gauge is 54% bearish, a full 16% more bearish than when the market peaked in September. All of these doubters will turn into reluctant buyers as the fear of a selloff is replaced by a fear of being left behind. Expect the market’s strength to continue pressuring underweight money managers to chase the rally higher into year-end. Stocks shrugged off early weakness and finished a smidge higher, but that is all it took to mark another record close. Overnight we learned Japan unexpectedly slipped into a recession. While that sent their stocks crashing 3%, our market barely noticed, down just a fraction at the open. The S&P500 has been unable to move past 2,040 resistance. Many traders feel this is stalling and foretells of an imminent collapse. Even though the market keeps making record highs, the Stocktwit’s SPY sentiment gauge keeps making new lows. That shows a material divergence between price and trader’s expectations. While traders are growing suspicious of this market, it is dangerous to argue with a market that holds strong in the face of bearish news. The headlines out of Japan were more than enough to send a vulnerable market into a tailspin. Fears over global growth triggered October’s 10% selloff. But this time it barely registered as the market clearly shifted from a half-empty outlook on the global economy to one that is half-full. The talking heads have a million reasons why the market is acting this way, but it really comes down to simply supply and demand. October’s selloff shook free most of the available supply. Now when the market runs into bearish economic headlines, there is no one left to sell the news and the market proves amazingly resilient. When no one sells, supply becomes tight, and prices go up. People can invent all the justifications they want, but this market’s strength comes from tight supply. Increasing cynicism bodes well for continued gains. Even though we are at record highs, traders are selling and shorting this consolidation. Unfortunately for them, they will be the next round of buyers forced to chase the breakout above 2,050. Markets fall from unsustainable levels quickly. Holding near 2,040 for nearly over a week shows these new highs are not unsustainable. Owners can continue holding and shorts need to be very careful. Today’s low-volume gyrations confused traders by sending off multiple false signals. The morning’s breakout convinced us this would be yet another routine, record close. Then the intraday plunge pushed us down to levels we haven’t seen in a week. Early highs fading into a weak close is never a good sign. But afternoon buyers swooped in and bought the 10-point “dip”, pushing us back to break-even. What could have been a very insightful day, instead turned into a whole lot of nothing. The last few days saw a decent amount of churn with buyers and sellers equally represented near 2,040. Trading sideways typically leads to a continuation because markets retreat from unsustainable levels quickly. Every move to new highs is met with suspicion. Many take profits or short the breakout. 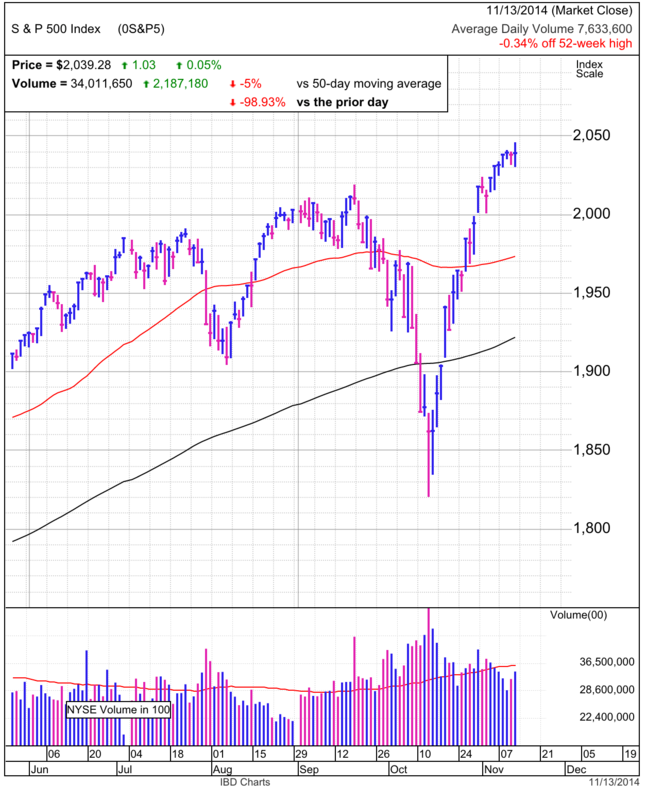 These traders make their moves in the first couple of days following a breakout, but if the market can withstand this early wave of selling, then it will resume uptrend once the supply from the doubters dries up. Already four days into this 2,040 consolidation, we can confidently assume the wave of profit-taking and shorting is already behind us. With another supportive day on Friday, 2,050 is all but assured. But everyone knows markets move in waves, so don’t let a pullback to support catch us by surprise. Maybe the rally fails Friday. Maybe we smash through 2,050 before slowing down. Only time will tell. On the other side, maybe we bounce off of 2,020. Maybe it is 2,000 or 1,980. As long as we see it coming and plan accordingly, we can respond intelligently, deliberately, and most importantly, profitably. Stocks finished with another record close. This puts last month’s emotional selloff even further behind us. While prices have rebounded decisively, many traders remain numb from the bitterly painful plunge to 1,820. If anyone is not totally dumbfounded by this market, then clearly they are not paying attention. We went from record highs in September, to a world-is-ending selloff in October, and are right back to making fresh highs in November. This was one of the most abrupt moves in recent history and it did an amazing job of humiliating nearly everyone trying to trade it. October’s sell off triggered the highest volume we’ve seen all year, but the subsequent rebound has been much more sedate. While many prognosticators claim the low-volume rebound shows lack of conviction, they are misinterpreting this as a bearish phenomena. While the lack of conviction is real, the contrarian investor sees this as a bullish development. It shows a huge number of recent sellers missed this rebound. With every new high, the market is leaving them further and further behind. And the pressure is building for them to jump back in. These regretful sellers are the source of the low-volume buying that will propel us higher into year-end. While the market is setting up nicely for a chase higher, we need to be mindful of support. A dip back under 2,000 or the 50dma so soon after reclaiming them shows larger problems are lurking under the surface. It is okay to own the market here, and sideways trade that dips back to 2,000 is normal and healthy, but failing to hold support would be a major concern. Trade accordingly. Today marked another record close. It is amazing how far we’ve come in three-weeks; from the depths of despair to all-time highs. It’s been a volatile ride and most traders don’t know what to make of it. 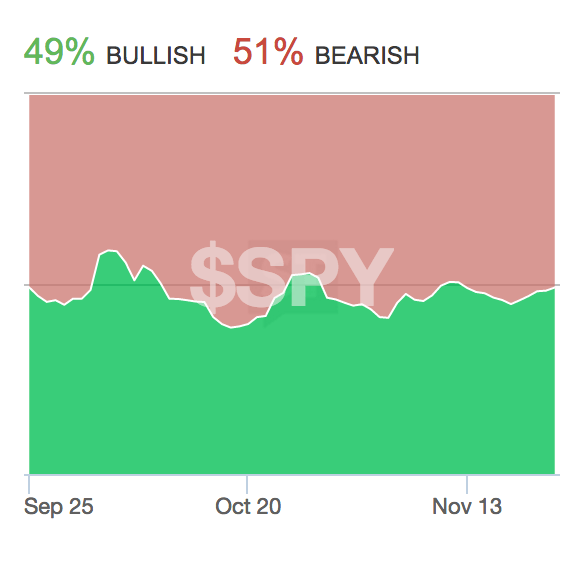 Stocktwit’s SPY sentiment still shows bears outnumber bulls on their stream, 55% to 45%. This is well below the 58% bullishness we saw the last time we were at these record levels back in September. While stocks have recovered, sentiment clearly has not. And even more interesting is sentiment actually trended lower while the market broke through the 50dma and 2,000. This shows a large number of traders are increasingly skeptical of this rebound. Since this is a contrarian blog, the more skeptical the crowd is, the more bullish I become. Many traders bailed out during the plunge to 1,820 and these sellers are watching in stunned disbelief as this market keeps setting record highs. In truth, many are hoping for the the rebound to fail so they won’t feel so foolish for selling at much lower levels. But the contrarian sees these regretful sellers for what they really are, the next round of buyers. While they won’t all come rushing to the market at once, their fear of a market selloff is slowly giving way to fear of being left behind. The risk of sitting out of this rally is especially acute for institutional managers that lightened up in October. 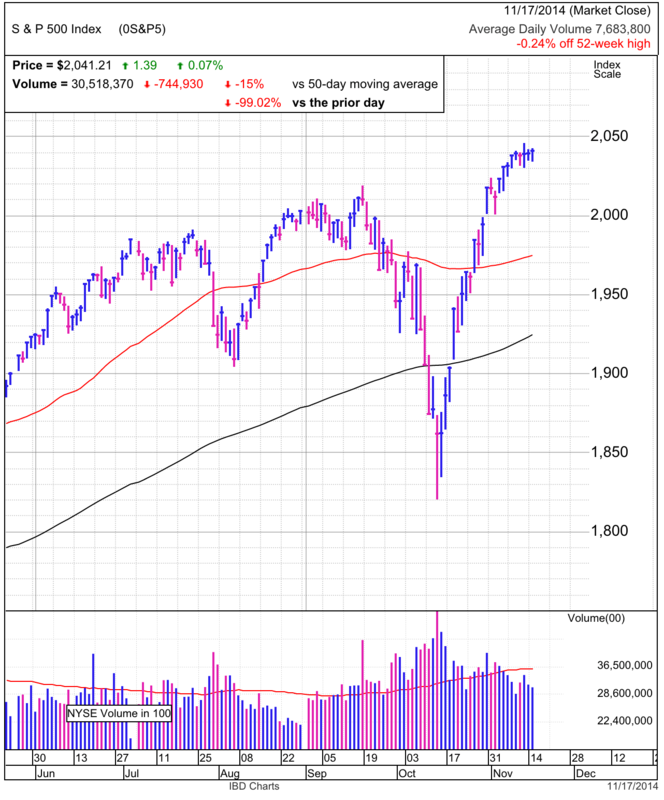 Since the market moved so fast without them, they will start feeling the pressure to chase as we get closer to year-end and they face the prospect of yet another year underperforming the “dumb” indexes. They can only wait so long for the market to breakdown before they will be forced to start chasing. So far the market is acting well and there are no signs we need to take profits yet. This gradual climb higher shows regretful sellers are buying back in and as long as their demand props up the market, we should continue higher. While it would be normal to see some sideways trade, failing to hold 2,000 support will be a concern. If the market continues under the 50dma, then we really need to worry. But as long as the market holds support, relax and enjoy the ride. Why the Election Doesn’t Matter. A little weakness on election day, but this was expected. We’ve come a long way in a short period of time. Resting here is normal and healthy. Uncertainty on election day is also fairly typical as those who wanted to trade their predicted outcome have already made their bets and those that are not sure will wait until tomorrow to trade the result. This creates a lull in trade on the day of. If the GOP wins the Senate, or doesn’t win the Senate, it doesn’t really matter to the market. After a few days of volatility and partisan pouting, it will move on to whatever comes next, like November’s economic and jobs data. If anyone doubts this, just consider the last election cycle. The market initially cratered off on Obama’s reelection as emotional partisan traders sold in droves. But they missed out when the market rallied 42% over the next 2-years. This caught the partisan biased traders flat-footed when they assumed another four years of “socialist rule” would ruin the economy. In truth, a divided federal government is good for markets because that leads to gridlock, status quo, and predictability. No matter what happens with the Senate, not much will get done with Obama’s veto stifling the Republican agenda so we should have a fairly predictable two-years left until the more meaningful presidential election cycle. Stocks ended flat following Friday’s record close. The lack of profit-taking and defensive selling is encouraging, especially if it continues through Wednesday. The market feels dramatically different than it did two-weeks ago. The fear that consumed it and lead to a series of dramatic down-days largely disappeared. Traders shifted from fixating on negative headlines to cheering every nugget of good news. But it is wrong to say sentiment made a U-turn this quickly. Much of the anxiety remains, the difference is those who are sacred no longer own stocks. After they finished jumping out of windows, we ran out of sellers and the resulting tight supply launched us higher. Basic supply and demand at work. What makes this a bullish setup is we have confident owners that either held the 10% dip, or had the courage to jump in and buy the plunge. This is both a brave and stubborn group, meaning they are extremely reluctant sellers. That tight supply is why prices have risen as quickly as they have. On the demand side, there is a huge number of regretful sellers that bailed out during October’s panicked move lower. Many of these sellers will come crawling back to the market in the next few weeks and months as the fear of a market crash is replaced with the fear of being left behind. Their misfortune selling low and buying high is what will keep this old bull market going even longer. It is unreasonable to expect the market to continue the recent rate of gains, so plan on a sideways consolidation. A dip back to 2,000 or even 1,990 is healthy and constructive given how fast the rebound moved. If selling spirals out of control and undercuts the 50dma, then all bets are off and there is a good chance October’s selloff was only a preview of worse things to come. But for the time being, the outlook remains cautiously optimistic.